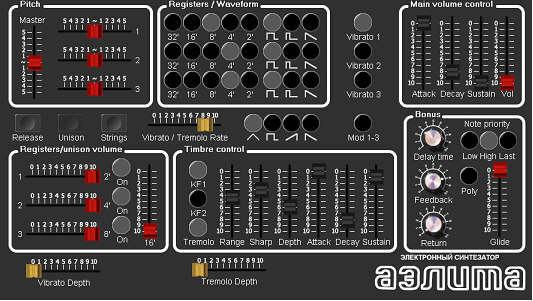 The Virtual Aelita VST-instrument imitates structure of vintage soviet synthesizer “Aelita“, designed in ’80. In addition to general capabilities, this plugin provides 6-voice polyphony, portamento and delay effect. In the archive you can also find the .fxb-bank with initial presets. This entry was posted in and tagged synthedit, vst on 30 May 2014 by rpocc. The new subsection is just open on the site: VST-plugins! This subsection contains free VST-plugins by Dmitry Shtatnov made under his brand SSSR Labs. (Solid State Sound Research Labs.). The first plug-ins suite is just uploaded. Lissajous Suite is a set of VST plug-ins intended for experiments with the graphical representation of the waveforms on an oscilloscope. This media experiment genre is known as Lissajous music. Some demonstration videos will appear later. 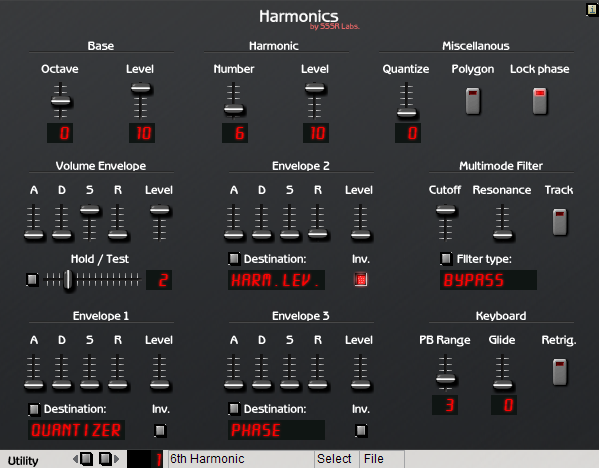 The first one shows features of the MIDIHarmonics VST instrument. This entry was posted in SSSR Labs. products and tagged SSSR Labs., synthedit, vst, video, demo on 30 May 2014 by rpocc. 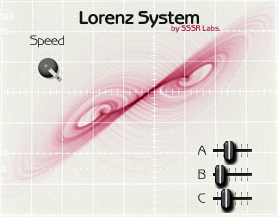 The Lissajous Suite Lorenz System is a generator of the Lorenz Attractor with variable parameters. Plug-in has 4 outputs, the first three of these corresponds to X, Y and Z axes, and the fourth is dummy. The outputs may be used as sources of the chaotic signal or/and may be connected to oscilloscope working in X–Y mode. The orientation of the figure can be changed with the 3D-Spatializer plug-in. Rate of the plot depends on used sampling rate but can be adjusted in the wide range with slider. All parameters can be adjusted via VST-automation. Lissajous Suite MIDIHarmonics — additive-substractive synthesizer and Lissajous curves generator. Synth is based on two synchronous sine “base” oscillators having constant phase difference: 90°. Then another pair of similar oscillators is mixed to the base sound. Their frequency is exact integer multiple of the base frequency. The mix can be tweaked with four modifiers affecting both sound and shape. Sample & Hold: can convert spyrographical shapes into regular convex polygons (dot clusters) with same number of vertices corresponding harmonic number. Multimode resonance filter: can integrate (smooth corners) or differentiate (emphasize corners) the signal. Controlled amplifier: can change the shape size. Modifiers may be controlled by four envelope generators. If you do not have a real oscilloscope, you can try nice VST-oscilloscope, J-Scope. Keep in mind that picture from analogue scope can be much different from a digital storage scope because speed of electron beam movement have direct influence on brightness of visible curves and lines. This entry was posted in and tagged vst on 25 Apr 2014 by rpocc. This entry was posted in Methods and tagged synthedit, vst, Approaches, portamento, schematics on 2 Jul 2012 by rpocc.